What Is SIBO? The Ultimate Guide to Understanding Small Intestine Bacterial Overgrowth Whether you’re already diagnosed or just seeking answers, today I want to give you the ultimate guide to Small Intestine Bacterial Overgrowth (SIBO). I’m covering all the fundamentals: what SIBO is, the symptoms it causes, and how to find out if you have SIBO… “Shivan, have you ever heard of something called SIBO?” I was on the phone, catching up with an old friend. By that point, I had been struggling with digestive problems for more than 20 years. And as anyone with unexplained digestive problems can tell you, I was desperate to find a cause – and a cure. After we hung up, I called my gastroenterologist and asked him the same question. He didn’t know much about it, but agreed to test me for it. A couple weeks later, the test results were in: negative. At first, I felt defeated. Another dead end. But I’m not a quitter – persistence is my superpower. 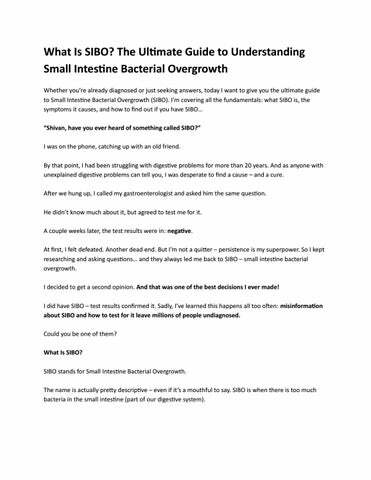 So I kept researching and asking questions… and they always led me back to SIBO – small intestine bacterial overgrowth. I decided to get a second opinion. And that was one of the best decisions I ever made! I did have SIBO – test results confirmed it. Sadly, I’ve learned this happens all too often: misinformation about SIBO and how to test for it leave millions of people undiagnosed. Could you be one of them? What Is SIBO? SIBO stands for Small Intestine Bacterial Overgrowth. The name is actually pretty descriptive – even if it’s a mouthful to say. 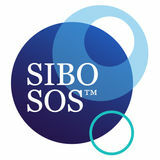 SIBO is when there is too much bacteria in the small intestine (part of our digestive system). What Causes SIBO? You might be thinking “How could all those different symptoms and diseases be related to SIBO?” Remember Hippocrates said “All disease begins in the gut?” He wasn’t wrong! The gut is the center of our immune system, and generally when something is wrong in any part of the body, there is also something wrong with gut. So what causes SIBO to happen? It isn’t a simple answer- in fact, this is a HUGE topic. Dr. Allison Siebecker says, there are two main categories for causes of SIBO: underlying causes and SIBO risk factors. Underlying causes for SIBO are when the body’s own natural protections against SIBO fail. There is a huge number of possible combinations of underlying causes and risk factors for SIBO – few people have the exact same causes. Could I Have SIBO? After learning about SIBO, are you wondering if you could have it? The most common way to be tested for SIBO is with a breath test. Some doctors also test for SIBO using an endoscopy with a culture or a special type of blood test. But be aware – there are some tests that don’t accurately diagnose SIBO – most commonly, stool tests. There are no stool tests available that can tell you if you have SIBO. Breath tests for SIBO are the most common. SIBO breath tests can be ordered by your doctor or practitioner -and in many places, you can find at-home tests you can order yourself or through a practitioner. The breath tests measure levels of hydrogen and methane gas in your breath – these two gasses are produced by the overgrown bacteria in the small intestine. It’s very important to find a lab or doctor who tests for both methane AND hydrogen gas. But unlike a simple blood test, breath tests can’t tell you simply whether you do or don’t have SIBO – instead they’ll give you data that has to be interpreted by a healthcare practitioner.